This weekend I am attending the 7th annual Dimensions of Political Ecology (DOPE) conference at the University of Kentucky. The conference is a unique opportunity to cavort with like-minded social scientists studying the intersections of humans and the ecological world. Deep in the heart of horse and bourbon country, it seems only appropriate that my blog this week explore an aspect left untouched so far in this blog – humans and horses. I normally shy away from studies involving horses, not because I don’t like horses, but because I have very little experience with them. Additionally, those individuals who do study equine related animal-human interactions do so most often out of a life-long love of and experience with these majestic creatures. But given where I am, and the important role that the horse plays in the hearts and minds of Kentuckians, I’m diving in this week to discuss an important research study that looks at just how incredible these animals really are through an examination of their ability to read and respond to human emotions. 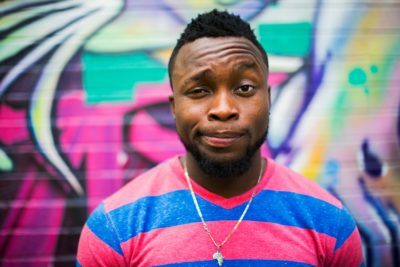 For many social species like humans and primates, facial expressions provide strong cues about how others are feeling and how to best to respond around them. This ability to read these kinds of social cues and emotions is an important aspect of survival in the wild and has likely played an important role in human evolution as well. Researchers believe that for domesticated animals, particularly dogs and horses, an ability to read human emotions may have been a key component in developing close bonds between species. Additionally, this ability can provide strong cues about anger and happiness, and thus whether or not approaching a human might result in physical harm or praise. Until recently, the ability to read human emotions had only been shown in dogs. Equestrians and horse lovers have long suggested that horses have this ability, based on years of personal experience and anecdotes. But now there is proof of their ability to read human emotions and facial expressions, an ability which is provides important clues about the development and strength of the equine-human bond. Researchers in England examined the behavioral and heart rate responses of 28 horses to either a positive stimuli, i.e. a happy male human face or a negative stimuli, i.e. an angry human face. Details of the exact experiment are outlined in the paper, but horses’ heart rate was monitored before, during and after the exercise. The exercise itself consisted of having a horse stand next to a female experimenter on a lead while another showed the horse the stimuli at varying distances from his/her face. Behavioral responses were recorded using video and later blind-coded. Horses received this experiment twice, receiving each of the stimuli once, at least two months apart. 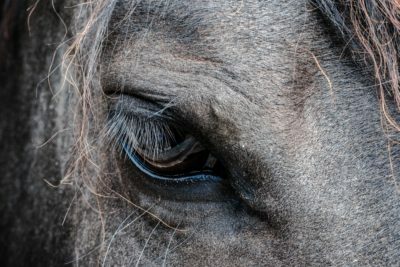 As has been previously demonstrated in dogs, horses in this study exhibited a left-gaze bias (i.e using their left eye to read the emotion with the right side of their brains) to negative stimuli. Experts believe that this lateralized response can provide important clues in understanding how perceived emotional responses and signals are processed. More horses in this study looked left than right when shown a negative stimulus, and this laterality effect did not exist when horses were shown positive stimuli. Interestingly, horses did not show any significant differences in approach or avoidance (i.e. approaching or avoiding the stimuli) in the negative vs. positive tests, but time spent looking left did positively correlate to time spent avoiding. This was not true, however, of time spent approaching. Looking right was not correlated at all with either avoiding or not approaching. Even more impressive was the heart rate response to negative vs. positive stimuli. When shown negative stimuli, horses heart rates rose significantly faster than they did in response to positive stimuli. Additionally, the mean heart rate difference between the baseline and stimuli test was positively correlated with left gaze bias and avoidance. Overwhelmingly these data support the idea that horses can read and will respond behaviorally to human emotions, particularly anger. Previously only shown in dogs, this data is another key to understanding how those animals with which we have coevolved have adapted to read and respond our emotions, something scientists have long posited is at the heart of these species’ close relationships with humans. But familiarity may also be a confounding factor in this study, as all of the horses were from riding stables and have been exposed to humans throughout their lifetimes. The researchers also rightly point out that when these types of tests have been done in dogs, they respond better with their owners or when the experimenter is the same gender as their owner. Gender played an important an interesting role in this study as well, although I felt the authors did a poor job of explaining it. First, as noted above, all of the experimenters themselves were female. However, all of the stimuli the horses were shown were male faces. Why did the researchers design the study this way? Is there data that show that horses respond more strongly to males than females? 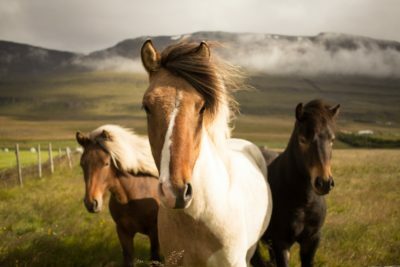 Would the study data have looked differently if they showed the horses female faces with the experimenters standing next to the horses themselves were male? Just as it will be important going forward to do this test with horses who are not as familiar with humans to better understand the evolutionary mechanisms involved, so too will it be important to parse out the gender biases introduced by this study design. The researchers do themselves note that “the generality of our findings could be further investigated through future studies in the particular effects of identity, familiarity, age, and gender on abilities to discriminate a range of emotional expressions” (Smith et. al. 2016, p. 3). Nevertheless, this is an important study that shows horses respond both behaviorally and physiologically to human facial expressions, both positive and negative. Unlike other studies discussed in this blog, this study does not necessarily concern a direct effect that animals have on humans. However, it does shed light on an important aspect of the equine-human bond that may be a significant factor in animal assisted therapies that utilize horses. Exploring these connections more in future studies could lead us to a better understanding of the underlying mechanisms at play in these types of therapies. Further, as Franz de Waal notes in “Are We Smart Enough to Know How Smart Animals Are?”, we have come a long way in our understandings and willingness to engage with notions around animal cognition, and emotion. What was easily dismissed only twenty years ago is now being re-evaluated with new and often novel techniques, elucidating more the complex inner workings of animals and their relationships with humans. As these techniques and our willingness to expand our thinking on these issues continue to develop, I believe that we will see many more scientific studies that show the ways in which animals and humans intersect and impact one another’s biology, behavior, and social worlds. Very interesting study for sure. Definitely gives insights into what animal lovers have always felt about their bond.